Douglas Joyce was born In Carbonear, Newfoundland in July, 1922 but began his schooling in St. John’s where his father was appointed minister at Wesley Methodist (later United) Church. In 1933 the family moved again, this time to ‘big, bad Montreal.’ For Douglas, just turned eleven, the move from the quiet remoteness and Methodist solidity of Newfoundland to the bilingualism and Roman Catholicism of French Canada was a cultural shock of the first order. He nevertheless threw himself into high school studies, Latin, history, English, algebra and geometry. He eschewed chemistry and struggled to ‘like’ French, in the main because it was badly taught. Just by chance, German now came into his life. When his father went to England to attend a Scout Jamboree, Douglas asked that he bring him some language books. 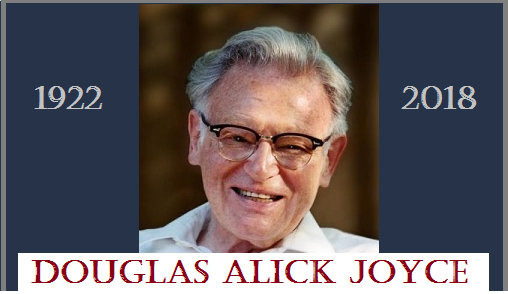 Reverend Joyce returned with Hugo’s German Grammar, a teach-yourself-German book, and young Douglas, drawn by the echo of Latin grammar and structure he found in German and by his growing interest in German opera, was hooked. In 1940 Douglas began his undergraduate studies at McGill University. His focus was on languages and literatures, Latin, English, French, Spanish and German, but dipping a toe into history, philosophy, economics, and sociology opened doors and added new perspectives. Throughout his McGill years he held a scholarship that paid half of the $400 tuition fee, and in his last year he received an offer of another scholarship – one year of residency at Harvard. The offer was too good to miss: Douglas went to Harvard to do an M.A. in Germanic Studies. German Literature with Karl Vietor. There was a good deal of catching up to be done. But the challenge intrigued him, in particular the juxtaposition of aestheticism and decadence that marked fin-de-siècle Vienna and led eventually to his interest in Hugo von Hofmannsthal. At the end of the year, he had acquired an A.M. (M.A.) from Harvard. It was now 1944 and the war was still raging. Douglas had tried to enlist in 1943 but was immediately rejected when the recruiting officer heard of his fight with rheumatic fever the previous year. He now sought other ways to serve; he found employment with the Postal Censorship office and put his language studies to use censoring letters to and from German prisoners of war in Canada. There were interesting aspects to the work, especially as it was enlivened by the diversity among his co-workers, Russians, Poles, Russian-speaking Mennonites from Western Canada, even a Baron from Vienna. And life in Ottawa had its virtues – cycling in the Gatineau hills, skating at the Minto Club. Douglas even found time to act as a supernumerary, an Egyptian soldier, in a local production of Aida. In addition, Douglas made it a point to go to Parliament one evening a week, drawn by the likes of Louis Saint Laurent, M. J. Coldwell and Tommy Douglas, and to attend typing classes at a commercial college. The year passed quickly. After a year away from academe, Douglas felt convinced that words and ideas were his proper environ. In 1945 he applied to Harvard and was accepted as a PhD candidate and as a Teaching Assistant. That meant that he could earn his keep, gain some teaching experience, and hear such men as Taylor Stark, Karl Vietor, Curt von Faber de Faur in German and in English, Douglas Bush and Mumford Jones. From their lectures he developed an interest in Geistesgeschichte, a sense of the history of ideas, and appreciation of the creative process that turns experience into a work of art. These were heady days and Douglas made the most of them, dedicating himself to the Widener Library stacks and at the same time enjoying the cultural life of Boston even to the extent of singing in the chorus when the Boston Symphony presented Bach’s B-Minor Mass. In 1950, with his PhD in hand, Douglas came to Toronto, more specifically, he came to Trinity College. There was, in Douglas’s words, ‘a spiritual struggle between purely intellectual objectives at Harvard and a more balanced, more humane approach to academe at Trinity.” Compared to the great men of Harvard, Trinity faculty were more approachable, not so aloof – he even watched a baseball game between Faculty vs Students. And in time he came to look upon the Anglicanism of the College as an acceptable alternative to the Methodism of his youth. He became an active and loyal member of the College both as Chairman of German and in other administrative roles. He was active outside the College as well. When the Canadian Association of University Teachers of German was formed, Alvin Surerus, the first president, chose Douglas as the first Secretary-Treasurer, the man who would tend the finances and write the history of the new-born organization. Under his hand the minutes and communications were impeccable and the books balanced to a penny. A few years later, when the Association launched a journal, Douglas was again tabbed as Secretary-Treasurer. In this he was exceptionally conscientious and dedicated. He devised a matrix to record every subscriber, dues paid, and date for renewal. For three years he and the editor, with their wives, stuffed 300 journals into 300 envelopes, stuck on 300 address labels and licked 300 stamps three times a year. It was a happy day for all four, and for Seminar, when the U of T Press recognized this was a serious venture and took over the mechanics of it. After retirement in 1988 Douglas found one more chance to devote his talents to a cause when he became Secretary-Treasurer of the Toronto Round Table and then worked with his wife Dorothy to establish the Toronto Division of the Ontario Association for Children with Learning Disabilities. You will see the pattern in all these undertakings – Douglas was always willing to do more than his share of the work but he did not ask to share the limelight. Professionally Douglas devoted himself to a study of the works of Hugo von Hofmannsthal, in particular the problematic comedy Der Schwierige. He took up the task in a characteristically Douglas fashion: he collected 670 reviews of the play over a fifty year period, winnowed out 150 significant ones and from them distilled a composite picture of how the play had been presented and interpreted over that period. His book was well received and brought an invitation to contribute an essay to a later volume. Douglas was not a practical person; he could not fix a leaky tap or change a flat tire. Nor was he at home in the technology of the modern world. But when he had to, he confronted it with stubborn persistence. When he first phoned a friend and got instead a strange voice asking him to leave a message, he dropped the phone in fright. Then he did a very Douglas thing; he screwed up his courage, dialled the number again and defiantly left a proper message. Similarly, feeling the need to record the beauties of the physical world and the mysteries of the human psyche, he mastered the intricacies of the single lens reflex camera and became a more than merely acceptable photographer. In his latter days, still curious and eager to learn, he undertook to play the clarinet. In some minor way Douglas was not entirely of this world. His thoughts came out slowly, sometimes exasperatingly slowly. You just had to be patient because the thought that eventually came out was worth the wait. You were waiting because Douglas was fighting to find the words that could say all he wanted to say, that could convey in one perfect utterance the intellectual comprehension, the aesthetic appreciation, and the emotional significance that he was wrestling with in the face of a worthwhile passage of literature. There is so much more one could say about Douglas – his love of music, his devotion to Dorothy, his delight in his children and grandchildren. He was not judgemental, he never said a bad word about any one. On the contrary, friendships meant a much to him, having a friend and being a friend. In his death Germanistik in Canada has lost a good and loyal friend. On July 1, 2018 Douglas Joyce slipped quietly away at Sunnybrook Hospital in Toronto surrounded by his family.